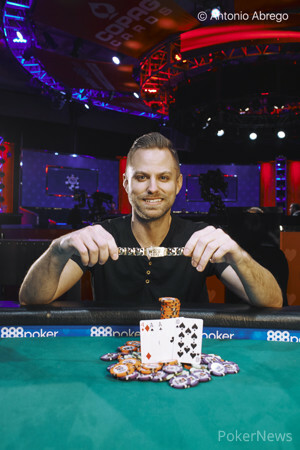 Iowa's Tyler Groth triumphed in the Event #25: $1,000 Pot-Limit Omaha after edging out a 1,058-player field to take home the $179,126 first prize along with his first WSOP bracelet. "I am an O8 [Omaha Hi-Lo] player and took on a lot of great PLO players. I am in shock, I am really shaking," he said. The 32-year-old came back for the final day third in chips with 11 players remaining. Nobody had a better start to the finale than Groth, who hit a full house twice and got paid for both of them, finding himself atop the leaderboard soon. Ultimately, Groth had also the strongest finish, but his journey towards the title wasn't all smooth for him as the former broker and now-professional player experienced some tough moments on his way to victory. The remaining players merged to a single table when Darren Taylor knocked out Jesse Chinni. Ten-handed play carried on for quite some time, with several doubles delaying further eliminations. In the end, it was former November Niner Bruno Politano who bubbled the official final table. Representing Brazil, the 888 Ambassador came back as the shortest stack and fought bravely, but he eventually parked in tenth place. Politano's aces were cracked by Allan Le, who flopped a diamond flush to send Politano to the rail. At that time, Groth was already downed to a short stack. Groth lost the vast majority of his chips in a collision to Darren Taylor when he flopped the bottom set of sixes against a set of kings, only to see the fourth six in Taylor's hand, preventing him from improving to quads. But Groth bounced back, sending Casey Carroll to the payouts in ninth place. The cards were turned face up preflop, with Carroll ahead with aces against kings. Groth, however, spiked another king on the flop. Mark Zullo was a third victim in a row to exit with aces in their hands. Zullo's elimination was a sour one. He was all in on the flop with the top set but Igor Sharaskin had flopped a flush draw and he hit a third club on the turn to bust Zullo in eighth place. After laddering up three positions on the last table, short stacked Daniel Spencer finally left the tournament in seventh. Spencer's double suited one-gapper airballed the board, leaving the pot to Taylor's ace-high. Sitting next to each other, Groth and Taylor were setting the pace of the final table, both maneuvering big stacks. But it was the start-of-day chip leader Sharaskin took care of Adam Brown who walked away in sixth. Fresh on the back of his third place in the $565 Pot-Limit Omaha Event, Sharaskin wasn't meant to top his previous result. He ended up all-in on the turn with a huge draw only to find himself drawing dead, running into Groth's full house. Groth's already huge stack was boosted massively as he controlled more than a half of the chips in play with four players remaining. Next to leave the table was Darren Taylor, who suffered in a set-under-set cooler, with Allan Le holding the best hand and also blocking Taylor's chances for quads. Le was the only player on the final table who previously reached the pinnacle of the WSOP, with the 2016 $1,500 Mixed PLO/8; Omaha/8; and Big O title under his belt. Le was second in chips, trailing to Groth's monster stack while Jonathan Zarin handled the smallest stack. Zarin, however, had already doubled several times during the day, and the key confrontations kept going his way. Zarin doubled through both Groth and Le, and his tenacity eventually cost Le a heads-up chair. Le ran kings into a flopped two pair of Groth and couldn't recover on either turn or river. “Well, you know, you got an ace-deuce double-suited hand. I was just going to play position. I knew he was gonna push, so all I needed to do was nail a flop ... and I hit the flop. That was when I probably felt I gonna win. I hope my name gets known after this,” Groth analyzed the hand in hindsight. Groth was on his way for the bracelet, coming to the final duel with more than a five-to-one chip lead. Zarin, however, remained relentless. He scored a double and then won another major pot to reduce the gap, but Groth never gave up the lead and soon regained the ground when he rivered a straight. Soon after the Level 29 started, it was all over. Zarin met with another unlucky river card, when he triple barreled for all of his chips with a full house. Groth, however, held aces and an ace on the river brought him a bigger full house to help him finally deny Zarin's resistance. “You played great, take it easy,” Zarin added before heading to the payout desk. 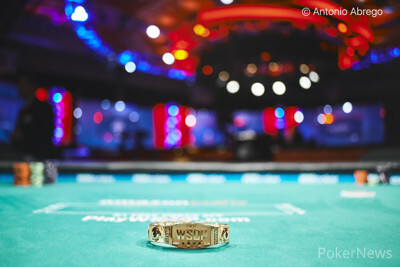 He received $110,655 for his efforts but the spotlight was on Groth who became the newest WSOP first-time winner. Originally from Stone Lake, Iowa, Groth now lives here in Las Vegas, pursuing his poker career. "I moved here to finally give live pro a go. I had an online career, and in 2011..." he said, pointing at the Black Friday events. "I literally quit my job and I was like, you know what, no more bosses, I am going back to poker. This is my first real run, that was probably my eighth or ninth World Series Event." 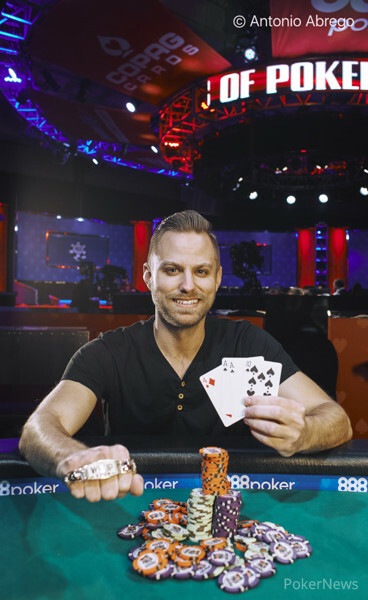 While Groth had previously notched only one cash worth $2,906 at the WSOP Circuit, his first reward from the major series is much thicker as the champion collected $179,129 for his fine performance. "The only time I felt pressure was when we first sat down at that table and there was lights, and it took a while to get into the zone,” Groth added. "He just hit a two-outer on the river," realized Jonathan Zarin after processing the unlucky outcome of the hand that saw him eliminated. Just as many of the previous heads-up pots started, the final one was limped. Tyler Groth was on the button and completed. Zarin's check was followed by the flop, where Zarin led out for 100,000. Groth called. The turn brought Zarin's second barrel — worth 300,000 this time. Groth called again. The key card of the tournament was the river, though. Zarin announced he was all in, and Groth called immediately, saying, "Aces full." Zarin couldn't believe that his opponent really hit the ace on the river. Groth's was trailing on the flop and turn, as Zarin held for a flopped set and a turned full house. 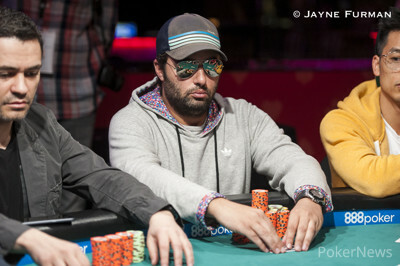 Jonathan Zarin fell just shy of winning the bracelet, outlasting all but one player in the $1,000 Pot-Limit Omaha event. Zarin earned $110,655 for his runner-up finish, while the elusive gold belongs to Jonathan Groth. Jonathan Zarin showed a bluff when betting the river and flashed for the rail. Besides that, Tyler Groth won most of the pots after coming back from the break to chip up slightly. The end of the level was reached, and the players were sent on a 15-minute break. Tyler Groth maintains a decent chip lead over Jonathan Zarin, who will start the next level with just over 16 big blinds. The majority of the small pots went to Jonathan Zarin of late, resulting solely from limped pots preflop. In one of them, Zarin and Tyler Groth checked the flop, and Groth bet the turn for 100,000, Zarin called. The river was checked through, and Groth announced a ten. Zarin had that beat with [Js8c4cx2c] and raked in the pot. Soon after, a flop was checked. Both invested 100,000 on the turn, and Zarin checked the river. Groth checked behind and announced two pair, which Groth had beat with . After a limped pot preflop, Tyler Groth bet the flop for 100,000, and Jonathan Zarin called. After the turn, both players invested yet another 300,000, and there were already close to one million chips in the middle. The river completed the board, and Groth bet 600,000. Zarin stared at his opponent and eventually called to see Groth announce six-deuce for a straight. Groth turned over , and Zarin sighed, turned around to his rail, and asked, "How does he have it?" After a series of smaller, mostly limped pots, a change of patterns occurred in a pot that started with Jonathan Zarin's raise to 160,000. Tyler Groth announced a pot-reraise, putting out 480,000. Zarin called. The flop was , and Groth said the word, "Pot," yet again, betting the full 960,000. Zarin counted his remaining chips and decided to let it go, continuing with 1,675,000. Groth now has just over a two-to-one chip lead. 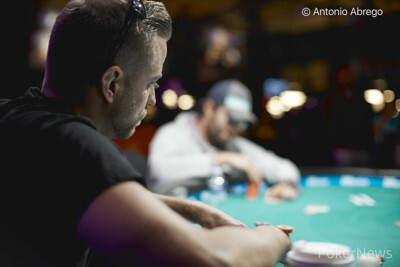 After the two big clashes, Tyler Groth and Jonathan Zarin went back to limping in each hand, and barely any notable pot has been played out since. One, in particular, saw Zarin check the flop, and Groth checked behind. After the turn, Zarin checked, and called a bet of 100,000 before checking again the river. Groth checked behind and mucked when Zarin announced a full house, rolling over as the winning hand.